A professional iOS file transfer software to transfer iPhone files. 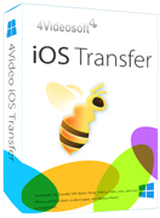 4Videosoft iOS Transfer 8.2 was available as a giveaway on April 30, 2016! 4Videosoft provides a 50% OFF coupon code: VIDEGOTD (apply to recommended and other products) for all GOTD users. How would you improve 4Videosoft iOS Transfer 8.2? Step 3. Click the "Register" button in the resigister window. SFTP is a secure file transfer protocol but very difficult for end users to transfer files. Binfer is a superb file transfer software, without all the headaches of FTP and nuances of torrents. See http://www.binfer.com/solutions/domains/file-transfers-for-personal-use. iTools work better, lightweight, doesnt lag like 4Videosoft on my old PC and its FREE forever!!! I pity those who pay real money for the same stuff. Does anyone have an idea why the program won't recognize that my I-Pod 6 Touch is connected. Downloaded and installed with no trouble but will not connect to my device. Would appreciate any suggestions. The freeware iFunBox works so well that I'm not sure why anyone would use anything else, especially if your iPhone is jailbroken and you've got appsync installed since it will install apps; directly or through the appstore. This can't do that. I'm not able to install the setup even when I disabled the antivirus. I then downloaded another setup from the developer site but again couldn't register as it asked for an email address used for purchasing it. Please help! GEEZ, you could have stated it only supports iOS 6 and higher before I went through the download and registration process. Also I see that it uses iTunes.... Will it work at all without iTunes installed? GEEZ, you could have stated it only supports iOS 6 and higher before I went through the download and registration process. Also I see that it uses iTunes.... Will it work at all without iTunes installed? PC55, No. ALL of these programs require iTunes. You are very wrong in the products that this program supports and you did the developer a great injustice. "It supports all iOS devices, including iPhone 6/6s Plus, iPhone 6/6 Plus, iPhone 5s/5c/5/4s, iPad Pro, iPad Air/4/mini 2 and iPod Touch"
PC55, You are very wrong in the products that this program supports and you did the developer a great injustice. "It supports all iOS devices, including iPhone 6/6s Plus, iPhone 6/6 Plus, iPhone 5s/5c/5/4s, iPad Pro, iPad Air/4/mini 2 and iPod Touch"
Does this require iTunes to be installed? Have installed but program will not recognize that my I-Pod 6 touch is connected. Program installed and registered with no problem but when hooking up device it will not show connected. Maksym Bay, your AV has found a false positive and it corrupted the files. To get around it- add Giveawayoftheday to your whitelist or exclustion. Then every future visit to site should work good- and you won't have to temporarily shut off you AV, which also works so that you can Download...Same thing happened to my son a while ago.. I can't believe there are still "smart" phones out there which need to use special programs to transfer files onto the phone and that are limited in the video formats they play. what ever happened to "It just works?" A good smartphone should just be connected to a computer, show up like an external drive, and allow you to drop any media file to any folder and be found automatically for playing. An earlier comment says that we seldom see anything for Android devices. Probably because they do not need any of this software. Android devices just work and are very easy to get files onto/off of, easy to backup contacts, messages, etc. I can't believe there are still "smart" phones out there which need to use special programs to transfer files onto the phone and that are limited in the video formats they play. what ever happened to "It just works?" A good smartphone should just be connected to a computer, show up like an external drive, and allow you to drop any media file to any folder and be found automatically for playing. An earlier comment says that we seldom see anything for Android devices. Probably because they do not need any of this software. Android devices just work and are very easy to get files onto/off of, easy to backup contacts, messages, etc. Jerry, "An earlier comment says that we seldom see anything for Android devices. Probably because they do not need any of this software. Android devices just work and are very easy to get files onto/off of, easy to backup contacts, messages, etc." There were lots of times Android backup programs were offered here; and there is a reason for it; It is not so easy as you describe, f.i. you always have to put your android tablet/phone in developers debugging mode, and, in most cases, root the Android device. "Very easy" is relative but when there are even warranty issues if you root the Android device and a risc of "bricking" it by rooting it, it is not my definition of "very easy". Jerry, <i>"An earlier comment says that we seldom see anything for Android devices. Probably because they do not need any of this software. Android devices just work and are very easy to get files onto/off of, easy to backup contacts, messages, etc. "</i> There were lots of times Android backup programs were offered here; and there is a reason for it; It is not so easy as you describe, f.i. you always have to put your android tablet/phone in developers debugging mode, and, in most cases, root the Android device. "Very easy" is relative but when there are even warranty issues if you root the Android device and a risc of "bricking" it by rooting it, it is not my definition of "very easy". Does GOTD offer include MAC version of this program? Thanks. Wow! Easy to install and use. I just use it to trasfer my music and photos from my iPad mini to PC. It does a very great job for me and the speed is fast. Thanks a lot! It's a great app! Whenever I want to transfer files between iOS devices, I guess, this app will always be my No.1 choice. I have used it to succesfully transfer songs from my iPhone 6s Plus to PC. It's faster and simpler than iTunes does. Many thanks for such a good app. I have used it to transfer my contacts from iPhone 6 to iPhone 6S Plus. Very simple interface and easy to operate. Recommend it! Nothing today for those of use that don't use iPhones - We seldom see anything worthwhile for Android phones and what we've had to date hasn't been very good or reliable. There have been a few Android-related apps on GOTD, but there are a few big differences between Google's & Apple's phones in that regard, that IMHO make it harder for developers to come up with software similar to 4Videosoft iOS Transfer that more users like. IOW [IMHO] there aren't that many apps for GOTD to choose from, & even fewer that folks like. Apple has the iTunes software, & there's but one line of phones to deal with -- with Android you have all sorts of brands & models, each running a modified copy of of one of several versions of Android, & not a great selection of Windows software from the manufacturers. Many of the similar Android apps that have been on GOTD required rooting the phone, & according to the comments, the software still wouldn't work on many phones.